At the beginning of the episode Will Graham (Hugh Dancy) is relaxing with his dogs, taking apart what looks to be a motor— no doubt one for a boat. Then out of nowhere, he seems to hear an animal, something calling out in distress. So Will wanders outside and heads for the woods where he thinks he hears whatever is making the noise. Soon enough Alana Bloom (Caroline Dhavernas) shows up to assist, in case he needs help. We see more and more the way Will feels about Alana. In the last episode, via Hannibal Lecter’s (Mads Mikkelsen) patient Franklin (Dan Fogler), we briefly met his friend Tobias Budge (Demore Barnes). In this week’s chapter, “Fromage”, we see him in quite a different light than just the friend with whom Franklin took in an operatic show. From there, we watch the process of strings being made, soaked, hung, squeezed, until they’re treated and hung again. Except instead of catgut, Tobias uses human guts. So part of why I love the Bryan Fuller & Co. adaptation of the Thomas Harris novels is because there is still such a radiant ugly beauty about the way they do it, I’m fully reminded of the books while the mark is left on their part in the visual medium. Much as I love The Silence of the Lambs, parts of Red Dragon, Manhunter, and yes Ridley Scott’s Hannibal, the television series, for me, will always be my favourite adaptation of the source material. Don’t write me off for saying that – Jonathan Demme’s The Silence of the Lambs is something I watch probably every few months, no joke, and I’m downright infatuated with Manhunter. There’s just something that Fuller and the directors of the episodes tap into in regards to the Harris novels I cannot get enough of, and week by week there’s plenty of it to enjoy. This episode, with Tobias Budge especially, we see tons of the good horrific material. Concerning Will Graham, “Fromage” goes deeper into his psyche. The aforementioned sounds Will was hearing were simply manifestations of who knows what in the damaged brain he carries around. Is this temporary, or will it leave him with worse problems? At first it begins with wandering out into the woods looking for wounded animals. Then Will beats a couple holes, one particularly massive one, into the wall cover his chimney, the inside of his house looking like a construction zone. However, by the finale of the episode this affects him to the point of danger. Not only is he having auditory hallucinations, poor Will Graham is still seeing Garret Jacob Hobbs (Vladimir Jon Cubrt). While at a new crime scene, a man essentially turned into a stringed instrument, like a human-sized cello, Will recreates the thinking then sees Hobbs in the audience, applauding his performance. It’s so perfectly creepy. 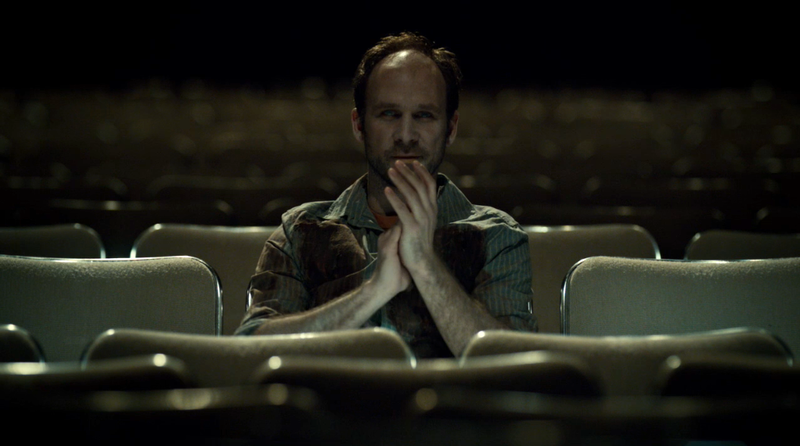 The way Hobbs just sits there clapping so nonchalant, like he’s been watching the most incredible opera that has ever been, I just thought it worked so well to show how prevalent Hobbs still is inside Graham’s head. Again, more issues of friendship come up here. Using Franklin and Tobias as a stepping point, we’re starting to see how Hannibal has truly come around to friendship. 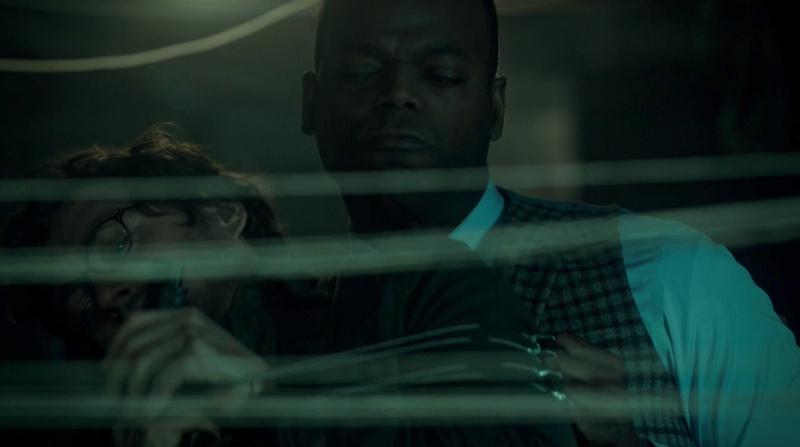 At the start of the episode, continuing a little through to the middle, Hannibal seems to still be concerned with conducting his vicious social experiments on poor Will. By the end, though, we literally see the tears of concern forming in Hannibal’s eyes, the birth of his real feelings of friendship and care for Will Graham come out. Then there’s Tobias, who seems intent on forming a relationship with Hannibal. He outright tells Dr. Lecter there would be a benefit in having a friend like him. Unfortunately for Tobias, the only friend Hannibal wants is Will. Along with the courtship Tobias tries to initiate (naturally he is the killer in this episode who made the man-cello) with Lecter, there’s Franklin who seems to strike out on every front of friendship. Hannibal doesn’t want to be his friend, least of all reasons is because they have a psychiatrist-patient relationship, and furthermore he doesn’t even want to be his doctor, as Franklin fixates too much on him instead of his own problems. Tobias isn’t truly Franklin’s friend, as Hannibal explains to him through the therapy. 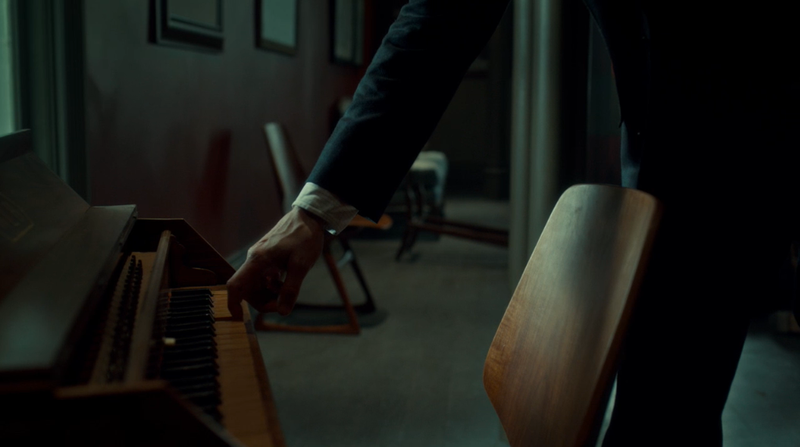 What I love most about the friendship angle is when this brings Tobias to Hannibal’s home, they have a dinner together. Along the way, Tobias reveals he began to follow Dr. Lecter. 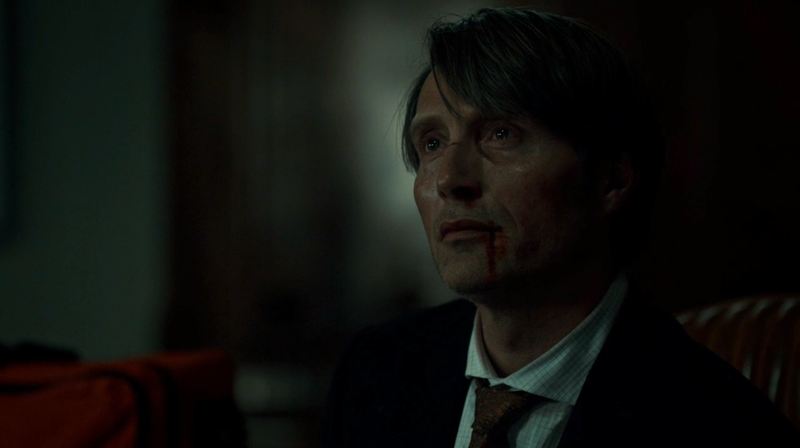 In fact, he followed him to a place out in the woods where he watched Hannibal do something and do it well. There’s an impressively tense few seconds here where they stare at one another. So much aggression and suspense in the two men’s faces. Back to Will Graham’s unfortunate experiences during this episode. After Hannibal has dinner with Tobias, he tells Will to go investigate him. He does so knowing full well that Tobias has already said he plans to kill any police/law enforcement who come looking for him. Realising this, Hannibal has setup yet another dangerous situation for Will, one of his experiments where he is controlling all the variables with the only constant: Will Graham. Once Will goes to the shop Tobias owns, things get quite a bit more dangerous. Another auditory hallucination sends Will running outside, into the street, leaving two Baltimore police officers alone with Tobias. When he returns, Will finds one officer dead, another missing, and so he goes into the depths of the shop, down the stairs into a muggy basement full of depraved, creepy artifacts and cello strings made from the guts of the dead. There’s a great bit here between Tobias and Will, a slight struggle, before Will is able to pop off a shot from his gun – grazing Tobias enough to knock him off, but also rocking his own eardrums. As Will recovers, his vision and sound messed up, Tobias runs off. Of course, Tobias goes to see Dr. Lecter. Luckily enough for him Franklin is also there for his therapy session. They’re actually discussing Tobias, and how Franklin thinks he is the one who killed the man and made him into the cello. This brings out an awesome scene because there’s this clear competition now, since the dinner scene, between Tobias and Hannibal. While Franklin is clearly unaware of Dr. Lecter, he tries to talk down Tobias from doing anything else too crazy. All the while, Hannibal stands listening. 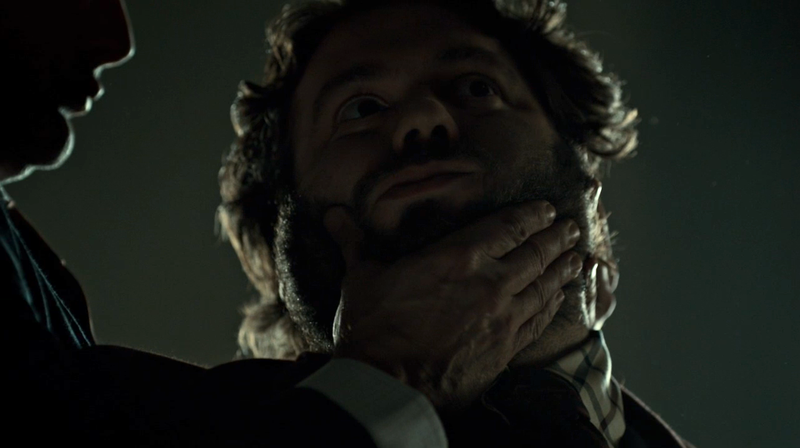 Then, out of nowhere… Franklin meets a cracked neck at the hands of Hannibal. There’s another classic moment between Tobias and Hannibal right after the kill. Tobias is obviously dismayed— he wanted to be the one to kill Franklin. Following this excellent bit, Tobias whips out what looks like some sort of garrote, though, others have said it is strings. More likely it’s a garrote, with small handle-like pieces at each end. What we get is an incredibly choreographed and raw fight between the two killers. I love, love, love the fight, but what I love most? The way we finally see Mads Mikkelsen as a completely separate entity from that of Anthony Hopkins’ Hannibal Lecter (I’ve said previously – love Sir Anthony just love Mads most). Here we get a view into how he’s not just athletic/in shape, he has this dangerous quality about him where you can imagine him perfectly as the hunter type of serial killer. For instance, Hopkins’ Lecter comes off as someone devilish, however, it’s more the type of killer you expect often goes for the advantage of the unexpected. He’s quick, but not in the way Mads’ Lecter is quick. Mads plays Hannibal as someone who can go toe-to-toe with the best and still come out on top – something we see to an even further extent in Season 3 with a fight between Jack and Hannibal. Gives a great distinction between this performance versus that of Anthony Hopkins. Two amazing sides to an intriguing coin. NOTE: Love Hannibal’s finisher – the Nightmare Stag takes nightmarishly real form. 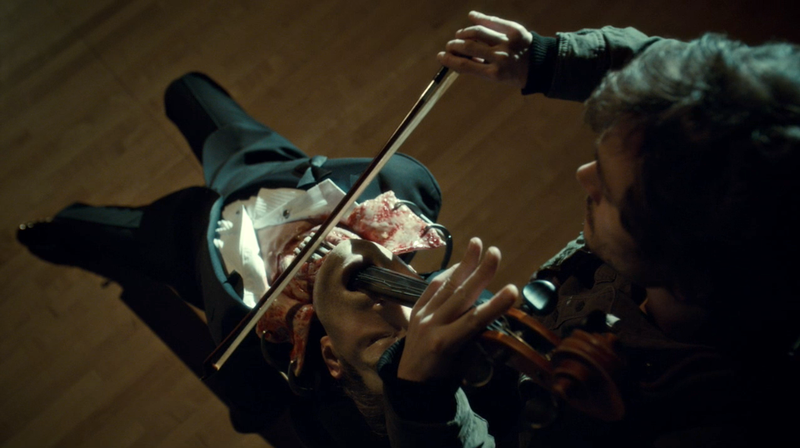 At the end of the episode Hannibal so obviously comes around to his romance with Will in a fully realised way. He sent Will in to face Tobias, knowingly understanding that Tobias wanted to murder him. Then once Tobias showed up at the office, he said he’d killed some police. The reaction on Hannibal’s face shows he thought Will was gone. It actually looked to upset him – surely why he decided to snap Franklin’s neck, to take something away from Tobias. 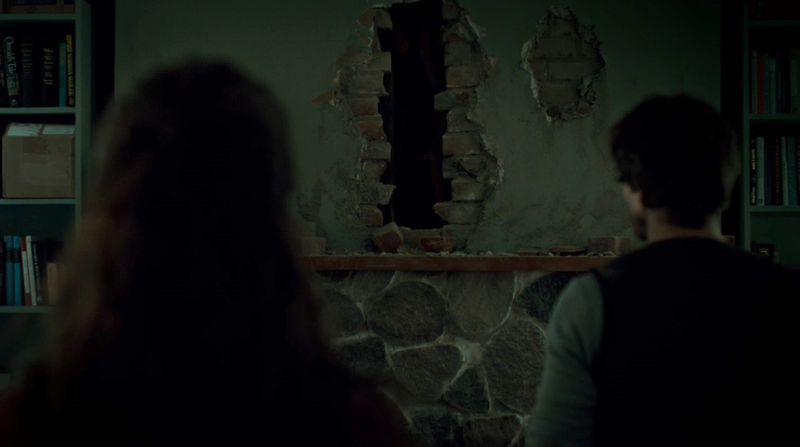 …you can see how relieved, even happy, Hannibal is that Will is alive and well. 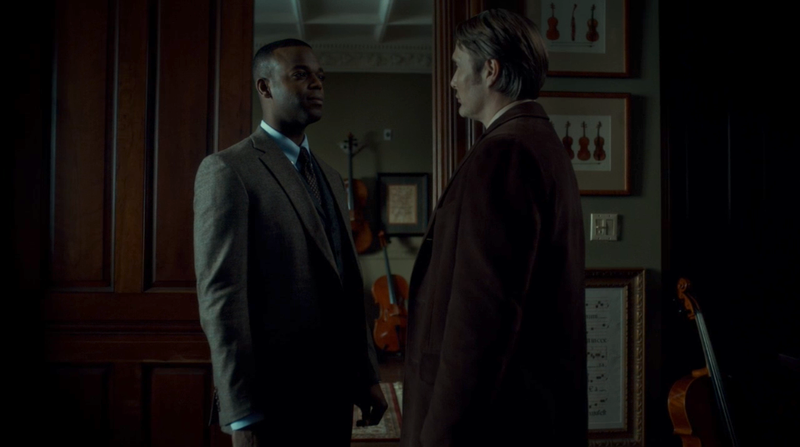 This is the beginning of Hannibal’s feelings of honest friendship. He’s becoming someone, or something, else. As we get a final scene with Bedelia Du Maurier (Gillian Anderson) and her patient Hannibal, he expresses the idea that there’s a possibility of real connection with Will. So, even though Hannibal goes on to perform more of his nasty little experiments, working behind the curtains, he really does care about Will. He sees the prospect of understanding. Will’s able to totally empathise with others, put his mind into the position of people who even repulse him totally, so Hannibal sees that as a possibility for him, as a friend who can see all of him. He wants more than what Bedelia gives him – even as we later find out there’s more to that relationship – Hannibal needs that understanding, that true acceptance, someone with which he can remove the person suit, the human veil, and bare the true Hannibal to without judgement, and of course without repercussion. The episode fleshes things out in so far as it moves further into the friendship aspect of Will and Hannibal’s relationship. Before, there was mostly the sinister experimentation of Hannibal. Now, though we see that again as things progress, there’s a real sense of bonding between the two men. Hannibal has found a kindred spirit, a doppelganger soul in his twisted worldview. Stemming from this, so many things will happen as we move further through the first season.